My CentOS vm was near the capacity of its allocated VHD. 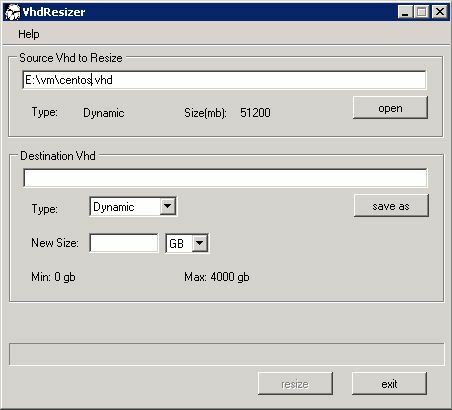 I used VHD Resizer from VMToolKit to expand the file container. Once it is expanded, the inner layers must expanded as well. This is a collection of info I found on google. 3. Press n then primary p start cylinder 14 last cylinder 4865 to add the newly re-sized partition. WARNING: Make sure the old and new partition start at the same cylinder position, not doing so will destroy your data. 9. You could also extend the volume group across disks and partitions: pvcreate /dev/hdb1; vgextend videovg /dev/hdb1; vgdisplay videovg. With this method use fdisk to create a new partition instead of recreating the original one. This is certainly safer since there is less risk to your existing data and it makes it easier to break up volume groups in the future. 14. ext2online /dev/SystemVG/RootLV while the filesystem is mounted or to be safe use resize2fs /dev/SystemVG/RootLV while the filesystem is unmounted. Look for the swap logical volume. Check current size with lvdisplay. Unmount the swap with swapoff.